Thank you so much for the inserts. I was amazed at how quickly I received them - I ordered them late Friday the 16th and they were at my door today (Monday) the 19th. That is great service! The inserts fit great with one exception, they are really tough to get out :-). I'm guessing the side adjustment screws will never be needed. Thanks again Ray D.
Slivers Mill, a Forrest Saw Blades distributor, aims to be the one-stop shop for all of your saw blade needs. 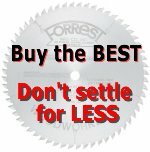 WE ARE THE LARGEST STOCKING DISTRIBUTOR OF FORREST SAW BLADES AND WILL SHIP MOST ITEMS WITHIN 24 HOURS. We offer virtually all Forrest blades for many varied applications. Serious woodworkers count on American-made Forrest saw blades for superior finish at an affordable cost. For a broader spectrum of choices we are pleased to offer Amana, Popular Tools Industrial and Oshlun saw blades. These brands have proven themselves over the years and compliment the Forrest line quite nicely. In addition to saw blades we offer Leecraft Zero Clearance Inserts and MicroJig Safety products to round out your workshop. These products not only provide a safer environment but improve the performance of your woodworking experience. We are in the process of adding more Amana products and CMT Orange Tools to our website including Router Bits, CNC Router Bits and Shaper Cutters. RECEIVE THREE $5.00 OFF SHARPENING COUPONS with ANY ORDER! This applies to saw blades only. Use one coupon per saw blade.